Fort Ross Pilgrimage - Double Service Hours Opportunity! 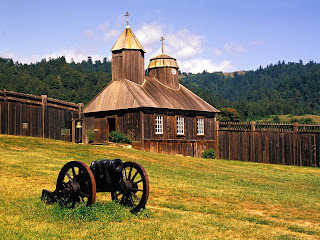 The annual Memorial Day pilgrimage to Fort Ross, organised for our Diocese by Archpriest Yaroslav of Holy Virgin Cathedral, will take place this year on Monday, 30th May (i.e. next Monday). A hierarchical celebration of the Divine Liturgy will take place at 9.00 a.m., followed by a procession to the fort's cemetery and a service for the departed. After the services, an open-air meal will be accompanied by a performance of religious and folk music by the St. Petersburg Men's Ensemble. This year, as a special incentive to attend and participate in this wonderful pilgrimage, St. John's is offering double service hours to both parents and students who help with the services and serving the meal during the pilgrimage! Simply join the pilgrimage at Fort Ross and assist with the luncheon, and you'll receive a credit of two hours for every hour volunteered! Fort Ross is under the authority of the California State Park & Recreation Administration, and is one of the most important sites in the USA for the history of the Russian Empire's early days in these lands. In light of the economic crisis, the CSPRA has found it necessary to close Fort Ross to visitors on weekdays, but it will be opened especially for this pilgrimage on 30th May. It is extremely important that as many of us in our Orthodox community as possible attend this pilgrimage - not only for it spiritual significance and the opportunity for fellowship, but also to demonstrate to the Parks Service that it is a cherished part of our heritage that needs to be protected and maintained. We hope that as many students, families, teachers and friends as possible will be able to join us Monday for this special event! The 200th anniversary of Fort Ross' founding will be marked in 2012. Among the many events planned in 2012 will be a series of lectures on the history, heritage and meaning of Fort Ross held monthly at both Fort Ross and San Francisco.